BEPS Action 5 is one of the four BEPS minimum standards which all Inclusive Framework members have committed to implement. One part of the Action 5 minimum standard relates to preferential tax regimes where a peer review is undertaken to identify features of such regimes that can facilitate base erosion and profit shifting, and therefore have the potential to unfairly impact the tax base of other jurisdictions. This progress report is an update to the 2015 BEPS Action 5 report and the 2017 Progress Report. 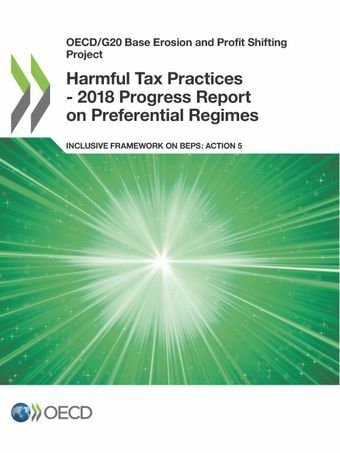 It contains the results of review of all BEPS Inclusive Framework members’ preferential tax regimes that have been identified since the BEPS Project. The results are reported as at January 2019. In addition, the Inclusive Framework agreed on a new standard for substantial activities requirements for no or only nominal tax jurisdictions. This report includes the details of this new standard and the other work on additions to and revisions of the harmful tax practices framework. Finally it contains next steps for the work on harmful tax practices. This annex includes the new global standard on substantial activities in no or only nominal tax jurisdictions, as was already published in November 2018. The Inclusive Framework on BEPS has decided to resume the application of the substantial activities requirement for no or only nominal tax jurisdictions. Originally a criteria set out in the harmful tax framework from 1998, it had not been applied to date. However, with the elevation of the substantial activities requirements in preferential regimes, and the broad-based membership of the Inclusive Framework working together on an equal footing, it was considered the right time to ensure that equivalent substance requirements apply in no or only nominal tax jurisdictions. This global standard means that mobile business income cannot be parked in a zero tax jurisdiction without the core business functions having been undertaken by the same business entity, or in the same location. In doing so, the Inclusive Framework will ensure that substantial activities must be performed in respect of the same types of mobile business activities, regardless of whether they take place in a preferential regime or in a no or only nominal tax jurisdiction. In addition, the outcome of the work contained an update on the FHTP’s criteria and guidance used in assessing preferential regimes.